^ 1.0 1.1 Before the enactment of the 1937 Constitution of Ireland, the head of government was referred to as the President of the Executive Council. 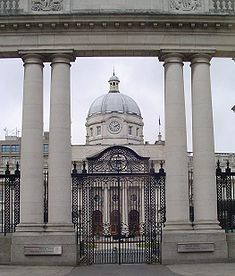 This office was first held by W. T. Cosgrave from 1922–32, and then by Éamon de Valera from 1932–37. ^ The Taoiseach, Ministers and every TD are having their pay cut today. TheJournal.ie. 4 July 2013 [18 December 2013].